Cloud Atlas is a film incorporating many genres written and directed by Tom Tykwer, Andy Wachowski and Lana Wachowski. The ensemble cast features Academy Award winners Tom Hanks, Susan Sarandon and Halle Berry. Also featured in pivotal roles are Hugh Grant, Jim Broadbent, Ben Wishaw, Jim Sturgess, Doona Bae and Keith David. As one of the more ambitious movies made thus far, this film adaptation of David Mitchell’s book is designed to be spiritually and richly provocative as could be imagined. The film is essentially an exploration of how each individual action impacts the other from the past, present and well into the future. Each soul is shape shifted from murderer to hero, while every act of kindness transcends across the centuries to motivate a revolution from within. The tour de force performances from the actors is not merely a gimmick. Rather, the multiple roles - from three to six each, are meant to illustrate the core themes concerning evolutionary nature. Each character is affected by their own immediate actions, the resultant chaos, others and their own future selves, as well. This new form of storytelling attempts to deftly weave together six different plot lines across the same number of genres including adventure, romance, thriller, comedy and science fiction cyber-punk. Each aspect is designed to blend across the years from 1849 through 2346 in as seamless a fashion as possible. Several of the key protagonists insist that they will not be subjected to criminal abuse, as their struggle for freedom remains punctuated by their past, present and future actions. Stories connect through an 1849 Pacific Ocean voyage diary; a composer's letter to his friend; a nuclear power plant incident; a publisher's unfortunate nursing home experience; a rebel clone in Korea and further into the future with a tribe in post-apocalyptic Hawaii. The pervasive undercurrent of cynicism by some of the villains is succinctly expressed by Hugo Weaving, who insists that those who try to upend the natural order of the world will not fare well. Indeed, this point is well-documented throughout the entire film. As the characters progress through their many lives, it is surmised that every person is essentially a part of the schematic of the universe. Each and every crime and kindness is what causes the future to be what it ultimately becomes. The independently sourced budget reached $102 million, while Warner Brothers paid $15 million for distribution rights of the movie. As such, Cloud Atlas is one of the most costly independent films ever produced. 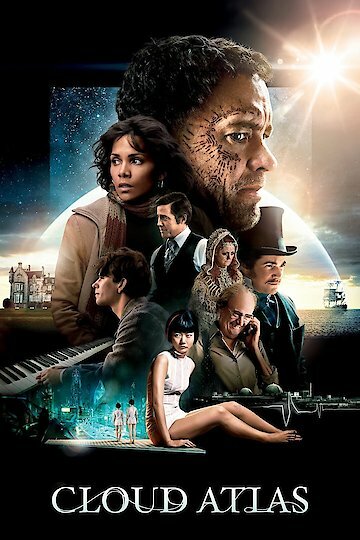 Cloud Atlas is currently available to watch and stream, download, buy on demand at Netflix, Amazon, Vudu, Google Play, FandangoNow, iTunes, YouTube VOD online. After Halle Berry's fiance and ex got into a fist fight on Thanksgiving, Aubry is set to appear in court in December.